What better way to open a concert on a snowy, windy Sunday Edmonton afternoon, than with a work written in the depths of winter by an Edmonton composer looking forward to the blessings of spring? John Estacio’s ‘Orchestral Fanfare’ Spring’s Promise, which opened the Edmonton Symphony Orchestra’s concert on Sunday, April 23, was just that – though it has to be said that on the same day in April 2004, the year it was written, the temperature in Edmonton was a balmy 19oC, not a snow-ridden -2 oC. An enjoyable and atmospheric work it is, too, a kind of little orchestral showpiece rather than a fanfare, with a tinkling opening like the last of the snow sparkles, and an eventual movement towards the break out of a big tune (the dawn of spring) before the return of the opening. The tone is largely derivative rather than strongly personal – there are echoes of Respighi and Ravel’s Daphnis et Chloe, and the central brass fanfares reminded me of those in Britten’s War Requiem – but it is very neatly and clearly laid out, and the touch of having the wind and brass scattered around the Winspear added to the atmosphere and the spatial sense. It well deserved its hearing, and conductor Alain Trudel secured some crisp and enthusiastic playing for the orchestra. It started what was, for a number of reasons, rather an odd-ball of a concert, if an enjoyable one. It was followed by the ESO’s principle cellist, Rafael Hoekman, making his debut as a soloist with the ESO with Tchaikovsky’s Variations on a Rococo Theme. I have to confess that I have tried, for decades, to like this celebrated work, but without success, but Hoekman half-persuaded me with his warm cello colours, though he could perhaps have allowed himself to be a little more expressive in what is quite an emotive work. He then played an unusual encore with the orchestra that taxed all his virtuoso skills: David Popper’s Elfentanz, Opus 39. Popper was a late 19th-century Bohemian cellist and composer, who wrote a number of virtuoso cello works. The Dance of the Elves lived up to its name, with some fiendishly fast scurrying up and down the cello by the elvish bow (including quite a lot of very high playing). It is a kind of Fritz Kreisler showpiece for the cello, with the orchestra providing the hall-of-the-mountain-king landscape backdrop to the cello playing. Hoekman played it with enormous enthusiasm, rightly shared by the audience, and to considerable effect. The first half ended with conductor Trudel – and the orchestra – shining in a fine performance of another Russian favourite, Rimsky-Korsakov’s orchestration of Mussorgsky’s Saint John’s Night on the Bare Mountain. It had really tight discipline and control, the shading of diminuendos and crescendos at the beginning particularly effective, and there was some notable clarinet playing. 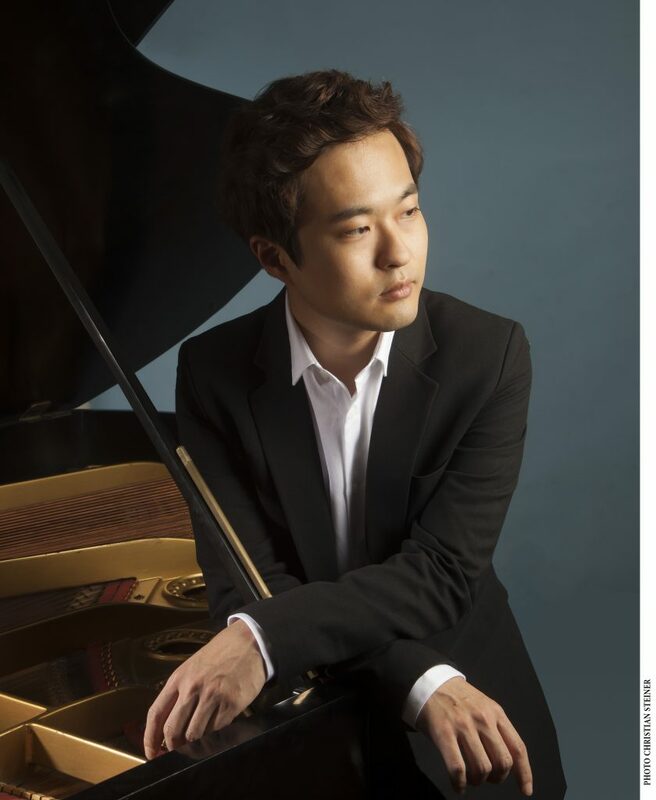 The second half featured the Korean pianist Dasol Kim, winner of the 2015 Young Concert Artists International Auditions, among other competitions. He opened with Prokofiev’s marvelous, exuberant, youthful Piano Concerto No.1, whose plethora of notes might seem entirely suited to Kim’s technique. For that technique is staggering, every note absolutely perfect, the intervals between the notes metronomic, the runs immaculate, a kind of blueprint of the score on the keyboard. In fact, everything to bring the house down for those who want their pianists to be the equivalents of technically-perfect Olympic gymnasts. The problem was that there are three kinds of great gymnasts: those who confound by their sheer technical perfection; those whose artistry is so spell-binding one forgives the occasional imperfection; and the all-so-rare Nadia Comănecis who manage to provide both. In pianist terms, Kim belongs to the first, and this is the only time I have heard this concerto live and been left cold. Prokofiev’s passion, fire, the enfant terrible winning the Rubenstein Prize playing this concerto as Glazunov walked out, hands over his ears – none of that was here, just picture-perfect note playing. Two examples will suffice. At figure 23, in the Andante, the right hands starts typically impish little upward runs. They are both sparkling delight and mildly ironic commentary: they are also quite important in the overall structure (they are later doubled in the orchestra). Here they were mere decorations, perfectly played without emotional expression, the marked pp exactly pp against the exact mf of the middle voice and the exact pp of the base line, as the score specifies, and were completely without any meaning. Later, the crashing accented chords of the opening of the allegro scherzando, punctuating the rapid forward movement of the piano, are passionate cries, not without touches of anger, anticipating, right at the start of his career, Prokofiev’s late piano sonatas. Here they were part of the pianistic, not the emotional, texture. Much the same might be said of the Chopin Andante spianato et Grande polonaise brillante that followed – the inner voices perfect, the nuances and the emotions absent. I am sure many really enjoyed these performances for their sheer technicality and literalness; and the competitions all over the world have now ensured that the technical standards of younger players have rarely been equalled in such numbers. Perhaps that, too, is what audiences now want, but give me musicality over technicality any time, substance over style, or even better, combine both (as in Richter and Kondrashin’s marvellous 1952 performance of the Prokofiev Piano Concerto No.1 – here those right hand runs in the andante are magical, never actually pp, and continue into the structure). The concert ended rather incongruously with Wagner’s Prelude to Act I of Meistersinger – incongruously, because, memorable though it is, this is the most solidly bourgeois of Wagner’s opera preludes, and it seemed rather out of place after the dancing elves, the Witches’ Sabbath of the Mussorgsky, or even the yearning of the Polish revolutionary Chopin. Not to mention the promise of spring, which inevitably came to mind as we went out into the snow of a grey Edmonton Sunday evening in April, that cruelest month.